I’m sure I will be in the minority when I say this, but this book dragged on a bit for me. From the beginning, we have Feyre back in the Spring Court. She is out for revenge and now that she is High Lady of the Night court. She is fierce. As aggressive as I have seen to date. The author was weaving such a compelling tale I was hanging on every hook. When Feyre forced Ianthe to bash in her hand with that rock, I thought oh my gosh she is a force to be reckoned with, but oh how things change quickly when she and Lucien escape to the Night Court. We have the Night Court gang back together. All the originals in one place once again, but now there is a threat to all (Fae and Human) in the way of Hybern and The Cauldron. This is where things went from absolutely stellar to mediocre. Yes, we have a few secrets exposed throughout after this, but it became such a rollercoaster ride of “How are we going to beat the Hybern King and The Cauldron” to “Oh we have a way to beat him.” Rinse. Repeat. My huge beef with this whole ordeal is we are lead to believe that the Night Court whom above all else is utterly unstoppable. We are reminded of this fact quite a bit. Not once did the author explain the foundation of everyone’s magic. One second they (whoever is in the action scene) are decimating the other side, then all of a sudden they have no magic left. Then turn around the next day or next fight scene, and have another plethora. Is that all it takes to regenerate is time? And it wasn’t just one character it was all of them. Where was the consistency for the Magic? Another Rinse.Repeat. We had Nesta who could “sense” the cauldron and who was “just like” Ameren, but what did that mean? Did it mean Nesta is a “God” like Ameren? I read Nesta doing some “earthquake rumbling” at the end, but that was about it. My thought on this is you shouldn't build a character up to not indulge your reader in the slightest about what they are about, especially when you have been dragging it out for 700 pages. I needed more. Perhaps she will write all of this at one point. I don’t know. Cassian- I loved his part throughout the book. It was real. His emotions were on point, and he felt the most authentic. She did a stellar job for him. Lucien seems to go away until the end of the book after they send him off. I am sure she has plans with him and Elain so maybe that’s why she just wrote him out at that point. He did secure Vassa for them though. I also liked the fact that he is not Baron's son, but Helion’s. Thank goodness. Elain- At least I knew her true meaning as a Seer and to see the future. Possibly the only thing that was easily explained, but also a bit of a mystery. Tamlin. I didn’t see his redemption. Unless she has plans for him in the future, I don’t even understand why he had to live. His only purpose in that whole book was to help Feyre out in the end? Bring Rhysand back to life? Feyre destroyed him, and he gave in just like that? Yeah, I wasn’t feeling that situation at all. It was too easy. 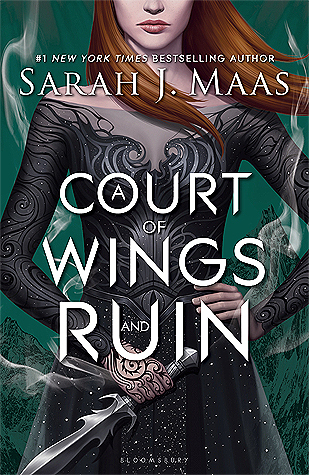 Mor/Azriel/Eris – Now there is a story, but alas we have Mor explaining to Feyre that she was in love with a woman. So she has been stringing Az along for FIVE hundred years and was always visibly upset when Eris was around. Don’t get me wrong I could give a hoot if she was in love with another woman, but the writing all throughout the series has had a huge undertone and tension between Mor and Azriel. Yeah, it’s fantasy and magical and all that other stuff, but after reading 2000 pages and then dropping that on the reader. Uh. You should have put the hook in book two. It just seemed completely out of place. The Bone Carver and The Weaver What a pleasant surprise that these two were siblings. I did rather enjoy their scene’s. I also enjoyed the utilization of these two, while I thought perhaps they might have held up a tad bit more of a fight, but that white light of the Cauldron just too strong. Ameren- Not sure what I think of her submitting herself to the Cauldron in the name of victory only to come back again. I enjoyed her character throughout the series. I hope we get more in the future. Rhysand- Oh how he is the dreamiest Fae alive. I did love his scenes I like that he has to struggle a bit, however as noted above the magic that Rhysand wields along with Feyre is above no other in the world. I read a lot about his magic, although I did not see how easily his magic worked until the end. When Feyre used up all of his power to put back the Cauldron and killed him. Yeah, that was pretty rough on me. I’m not going to lie. I cried a bit. To have him go through all that and then die in the end WHEW. Yeah. Feyre- Oh how I loved you, the ultimate powerhouse. I did see your growth through the series, but in this book, after you got back to Rhysand you felt different. It always seemed to be that Rhysand needed to put you above him when in fact, you were both already equal as you became High Lady of the Night Court. Am I wrong? Why need to reassure the reader that you are the ultimate above him, and not his equal, but master of all? I quite liked the fact that you were his equal. I didn’t feel it necessary to reassure the reader that you thought you were taking second in command all the time. It was almost like you weren’t solidified in the fact that you were indeed the High Lady and Rhys's equal. I will reiterate that you did, in fact, feel like you were his equal at the beginning of the book. Not sure why that had to change. I just feel like the whole story was out of whack. Will I read the next book? Yes. Although if the path is continued inconsistency, I will probably end with it.